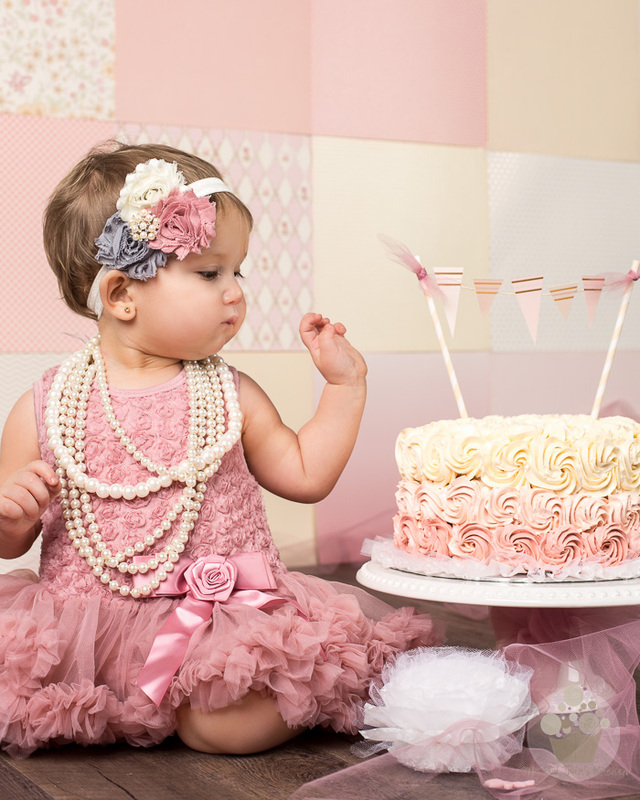 Indeed, ever since my precious grand-daughter had been born, my daughter kept telling how badly she wanted to do a “Smash The Cake” photo session with her for her first birthday. So for almost a year, we talked about it, planned it, looked at picture upon picture on the Internet for inspiration, to help us decide what kind of cake we wanted for the occasion, what colors we would go for, what accessories and backdrops we liked. Luckily, it seems like we both shared the same vision, so it wasn’t long before we made our official choice for the cake: it was going to be an ombre, and it was going to go from ivory to some kind of dusty pink. To go with those colors, I immediately thought that Lemon and Raspberry would be the ideal flavor combination. Perhaps not the first choice that comes to mind when one thinks “baby flavor”, but Matilde wasn’t going to be the only one eating that cake. Besides, the plan was that she would be SMASHING the cake, not eating it. WE, as in the adults, would be enjoying whatever little bits and pieces she would leave intact. Little did we know that she would end up leaving THE ENTIRE THING intact! Well, you know what? In retrospect, I’m almost happy she did. To trash this thing would’ve been a disaster. 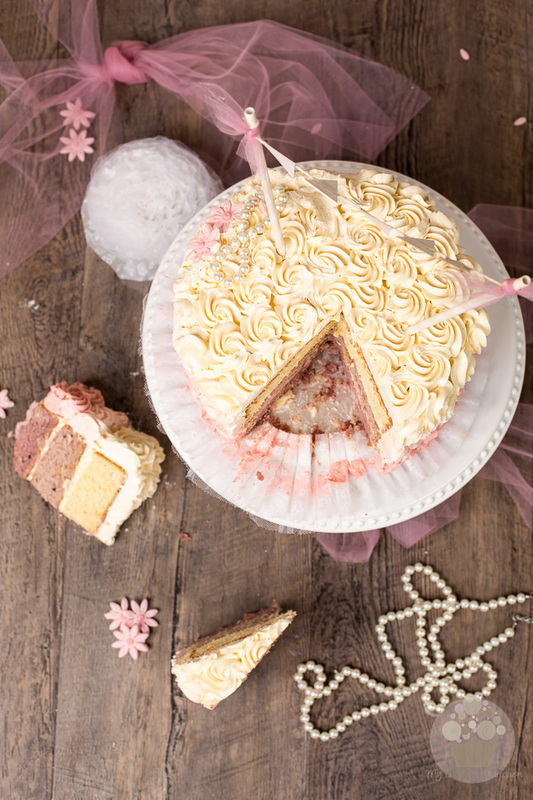 Because not only is this cake super pretty, but it’s also totally fit for a king! It has an amazing texture, a very agreeable density to it. I mean it’s firm and dense, but it’s also very moist and feels like it kind of melts in your mouth. 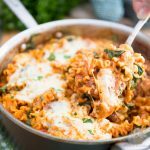 It’s got just what it takes of sweetness and the intensity of the flavor is just perfect. You get very subtle notes of lemon that pair perfectly well with the delicate aroma of the raspberries. When making cake, preparation is always key. 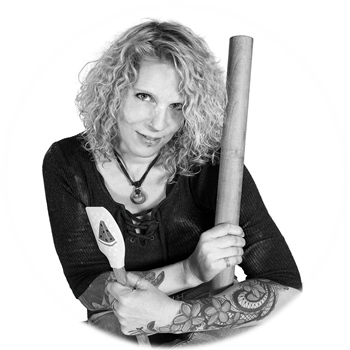 Make sure you have all your ingredients prepped and measured and your material ready to go before you start. Begin by preheating your oven to 350°F. Then, grease and flour three 8-inch round cake pans, making sure to remove all excess flour. 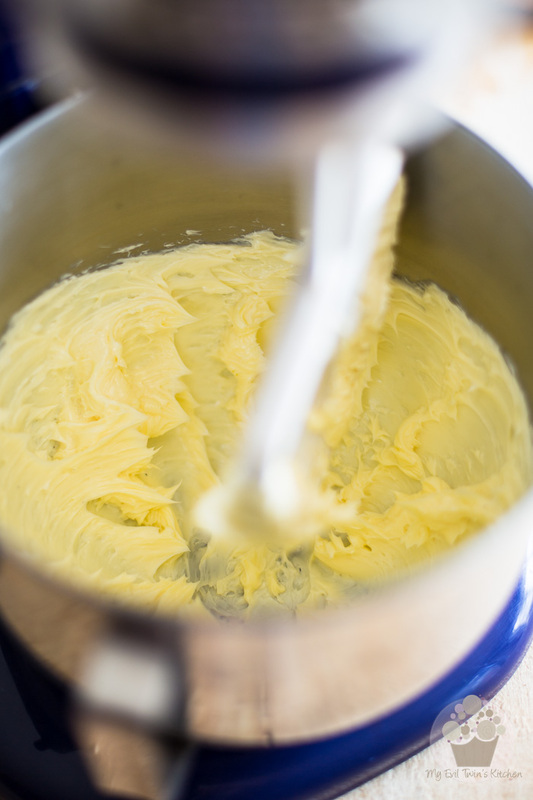 Weigh your butter and throw it in the bowl of your stand mixer. Measure your sugar and set aside. Sift together the flour, baking powder, and salt and reserve that in a large mixing bowl. In a small measuring cup, mix some buttermilk, vanilla, lemon extract and lemon zest with a fork. Reserve. Oh, and if you’re going to make your own raspberry puree, now would be a good time to make it, too. Simply process approximately 1½ cups of frozen raspberries until they are reduced to a fine puree, and then force it through a fine mesh sieve to remove all the tiny little seeds. All set and ready to go? Alright, let’s rock this joint! 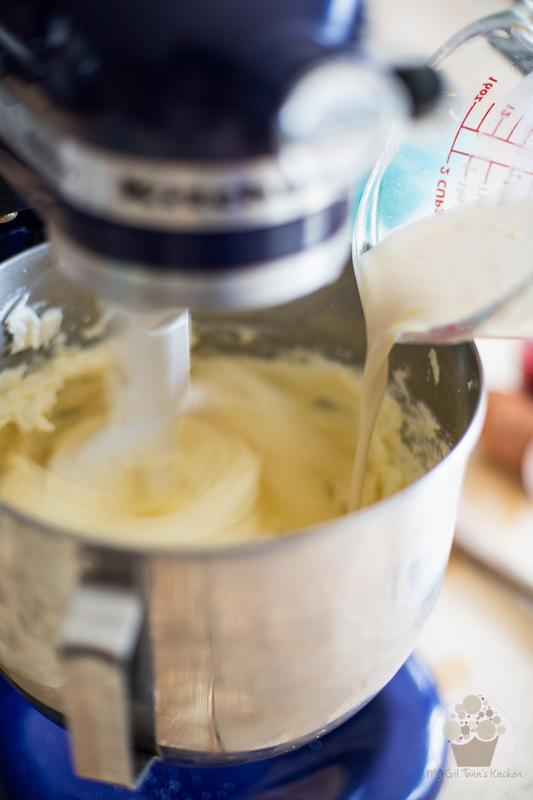 Equip your stand mixer with the paddle attachment and cream the butter on medium-high speed until it becomes nice and smooth and a beautiful light yellow. Add the sugar and resume creaming until the mixture becomes real light and fluffy, almost white. Lower the speed and add the eggs, one at a time, making sure to fully incorporate each egg before adding the next one. Next, add the buttermilk and mix until fully incorporated. 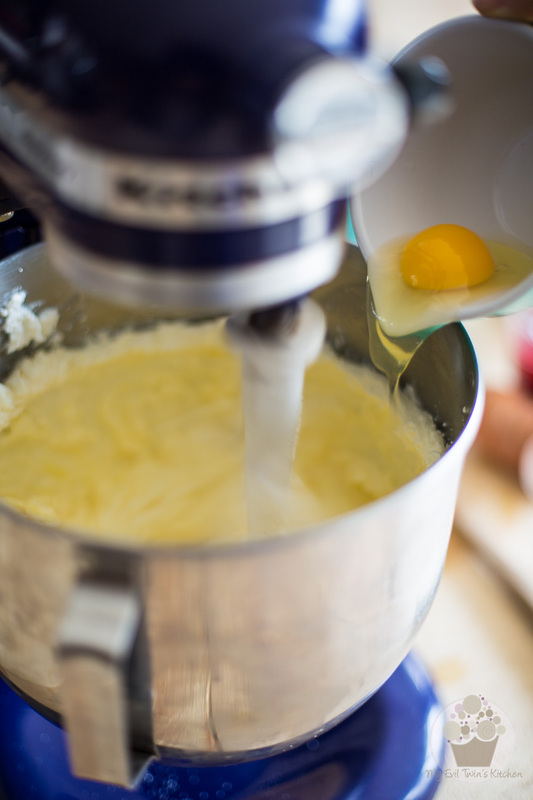 Stop the mixer and scrape the sides to make sure that all the ingredients are fully combined. Now, add the dry ingredients and mix on low until just combined, no more. This is what your final batter should look like. Yes, it is fairly thick. That’s totally normal. Transfer one third of this cake batter into one of the prepared pans and spread it evenly all the way to the sides. Set aside. 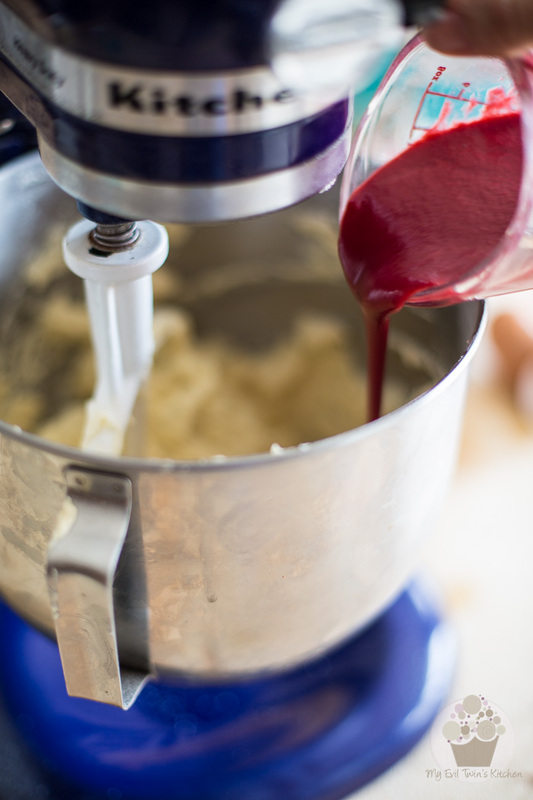 Add 1/2 cup of the raspberry puree to the remaining batter and mix on medium speed until it gets well incorporated. 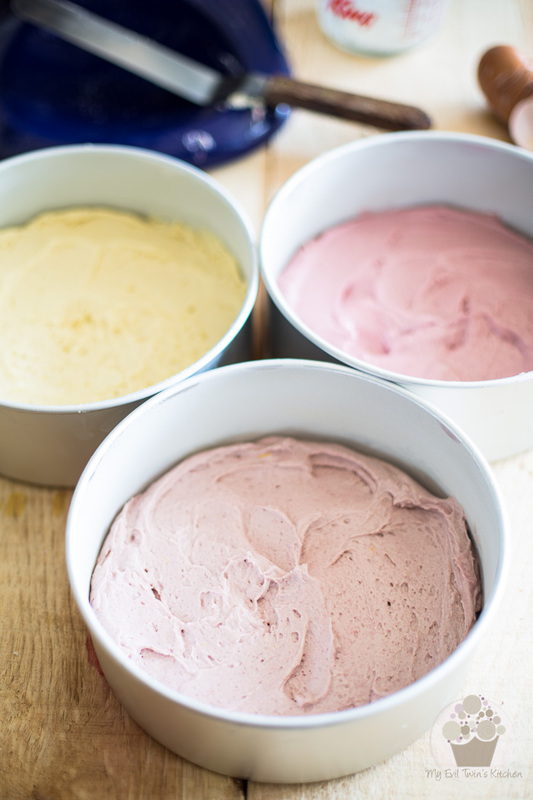 Pour half of this beautiful pink cake batter into one of the remaining prepared pans and spread evenly. 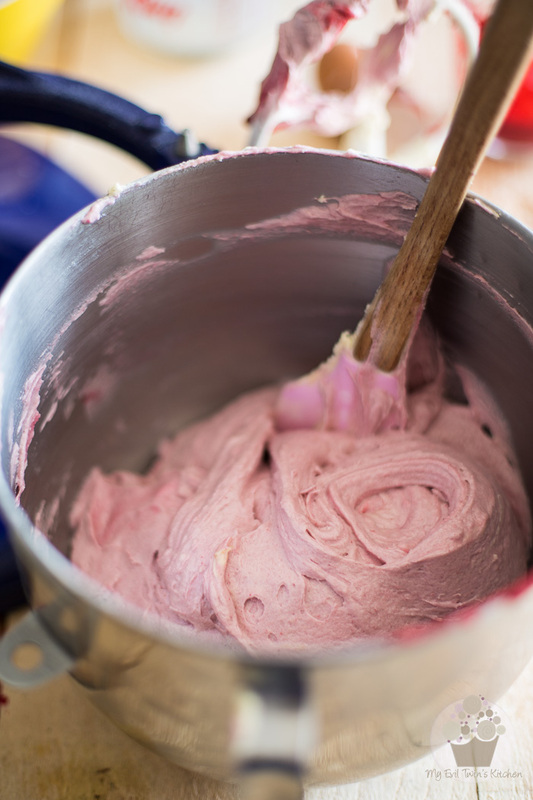 Add the remaining 1/4 cup of raspberry puree to the rest of the batter and mix well. Pour into the third pan and spread evenly. 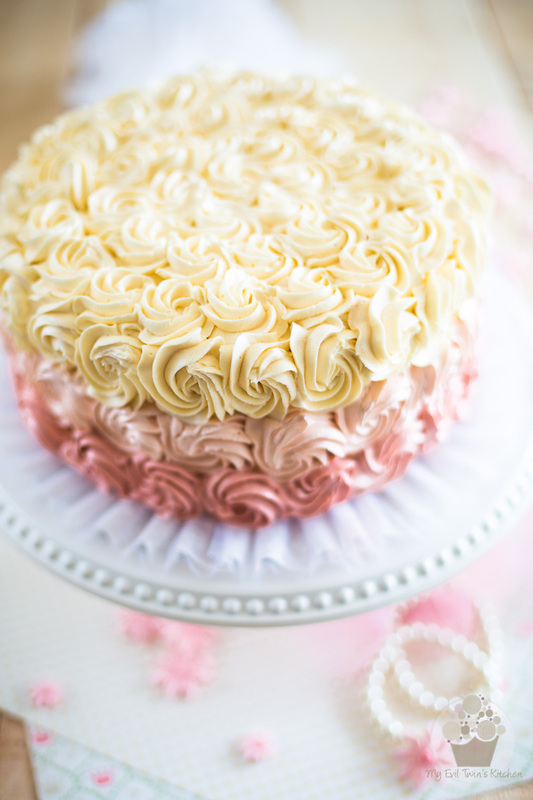 Now you should have different color cakes: a light yellow, a light pink and a slightly darker pink. Oh, and note that I used 3″ high cake pans, so that’s why it looks like my pans are fairly empty. The 2″ high cake pans would work perfectly fine; no need to get out of your way and get the higher ones. Place the cakes in the oven and bake them for 30 minutes, or until a toothpick or cake tester inserted in the center comes out clean. Remove the cakes from the oven and allow them to cool slightly in the pans for about 5 minutes, then turn them onto a wire rack and let them cool completely, preferably in the refrigerator. Make the Swiss Meringue Buttercream – Follow the instructions in the post, but make one and a half recipe (which means you’ll need to use 900g of butter, 12 egg whites and 750g of sugar). 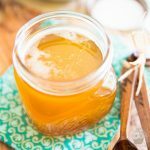 At the time of adding the vanilla extract, you’ll also want to add 3 teaspoons of pure lemon extract and several drops of ivory gel coloring. 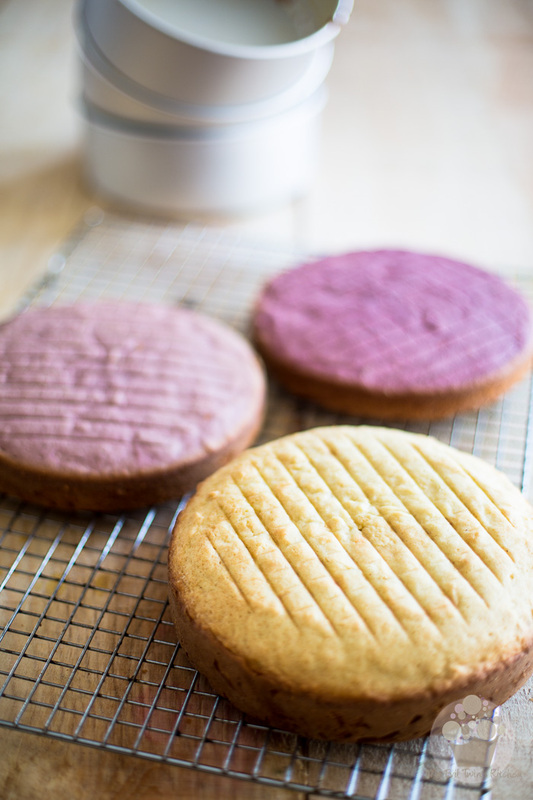 Place the darkest raspberry cake upside down on a cake board and cover its top with a good layer of ivory buttercream. Top with the lighter raspberry cake and spread some of that icing all over that cake, too. Next, place the light yellow lemon cake over the two other layers and crumb coat the entire cake with the ivory buttercream. 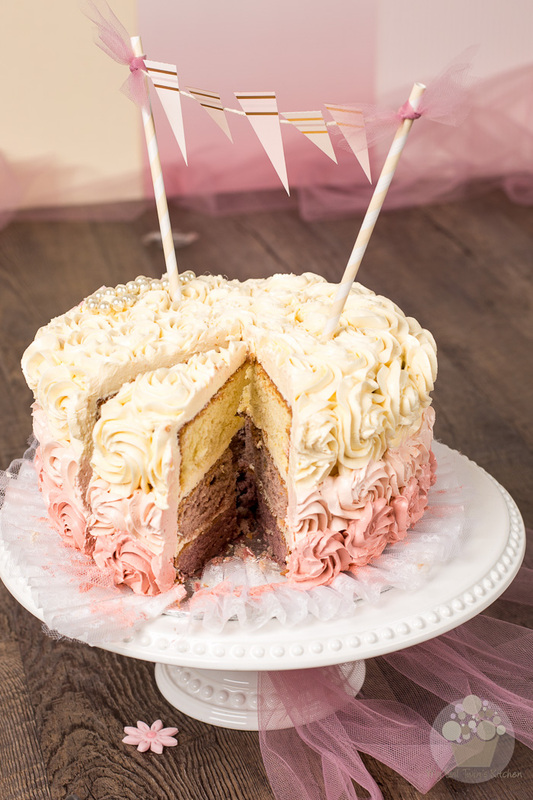 Fill a pastry bag equipped with a #844 star tip and pipe swirls all over the top of the cake, as well as all around the side of the light yellow cake. 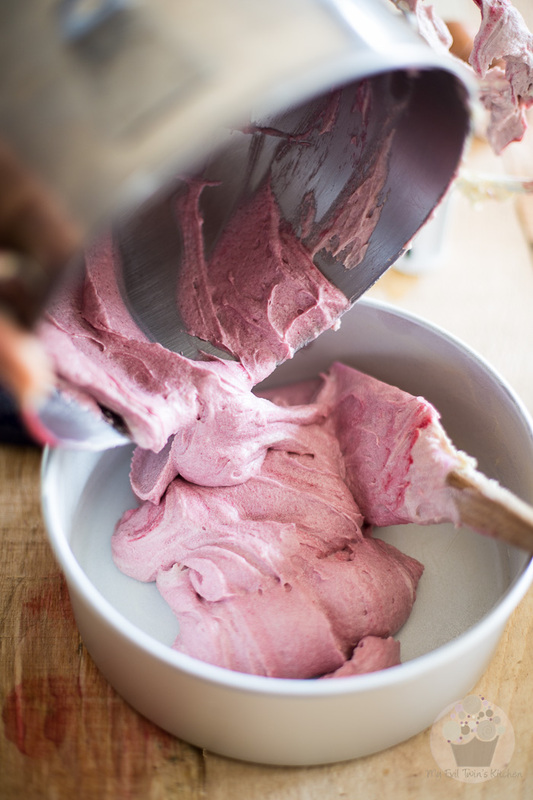 Empty your piping bag in the bowl containing the rest of the buttercream and add a few drops of Dusty Rose Gel Coloring to the whole batch, until a light, dusty pink color is achieved. Refill the piping bag and pipe swirls around the side of the middle cake. 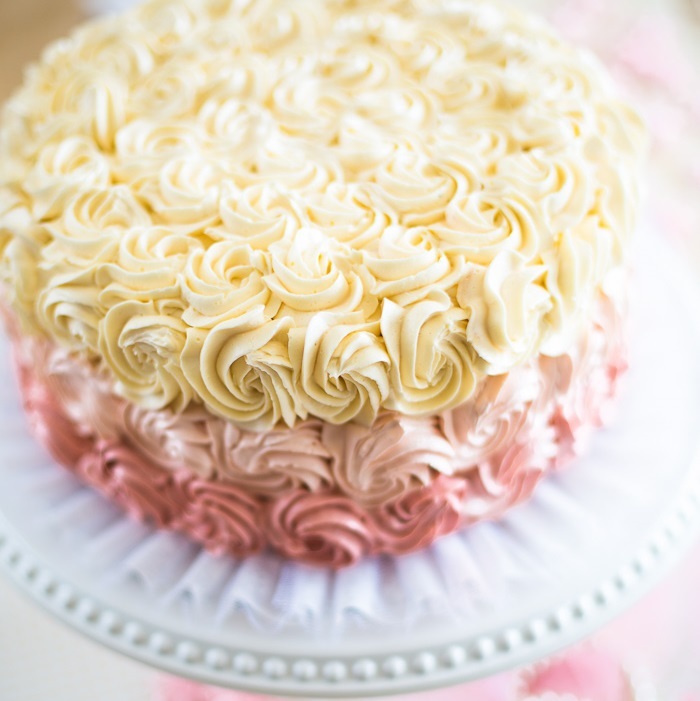 Return the leftover buttercream to the pot once again and add yet more coloring gel until a darker shade of dusty pink is achieved. Position the ruffle border if using. 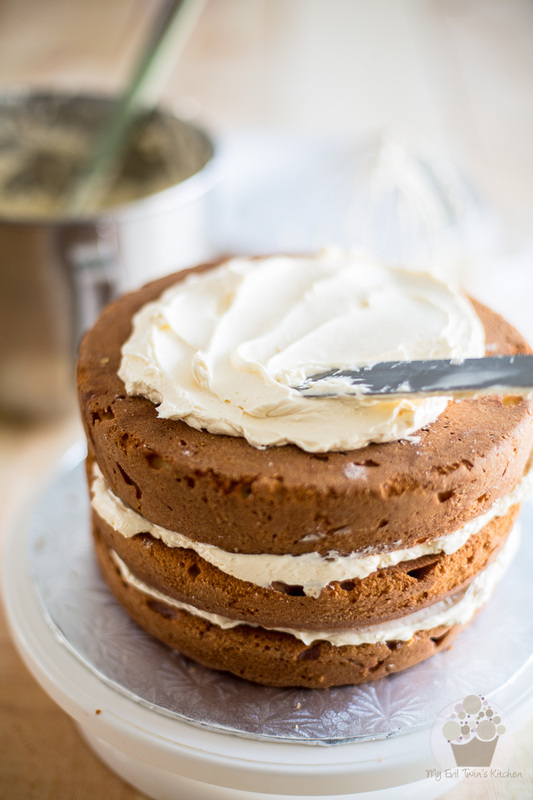 To do that, lift the cake slightly and carefully with an offset spatula and slide the border underneath, a few centimeters at a time, following the edge of the cake, until you went all around the cake. Cut out the excess with scissors. Now pipe the final layer of darker pink swirls around the bottom cake. TADA! You’re done! Spectacular, isn’t it? Now store your masterpiece in the refrigerator but make sure you serve it at room temperature. It’ll taste SO MUCH better that way. 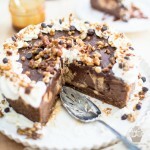 Simply take the cake out of the fridge at least 4 hours prior to serving. Or prior to… SMASHING THE CAKE!!! Oddly enough, it seemed like Matilde was almost afraid to touch the cake… Not sure if it’s because she didn’t want to destroy such a beautiful thing, or if it’s because she didn’t want to dirty her pretty dress, but whatever the reason may be, she obstinately refused to touch it. So we actually had to slice it open and hand her the slices. And even then, look at how delicate she was about it… maybe she didn’t care for the Lemon Raspberry flavor combination after all? Ha! I think she just doesn’t have a sweet tooth, that one. Instead, we’d be staring at a pile of crumbs! Not quite as elegant, right? Preheat the oven to 350°F. Grease and flour three 8-inch round cake pans, making sure to remove all excess flour. Sift together flour, baking powder, and salt, set aside. In a small measuring cup, mix buttermilk, vanilla, lemon extract and lemon zest with a fork. Reserve. 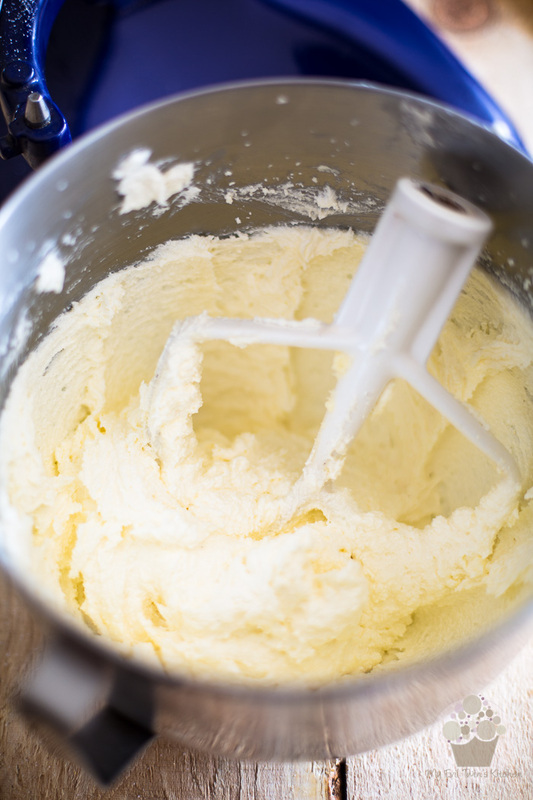 In a stand mixer equipped with the paddle attachment, cream the butter on medium-high speed until it becomes nice and smooth. Add the sugar and resume creaming until the mixture becomes real light and fluffy. Lower the speed and add the eggs, one at a time, making sure to fully incorporate each egg before adding the next one. Next, add the buttermilk and mix until fully incorporated. Stop the mixer and scrape the sides to make sure that all the ingredients are fully combined. 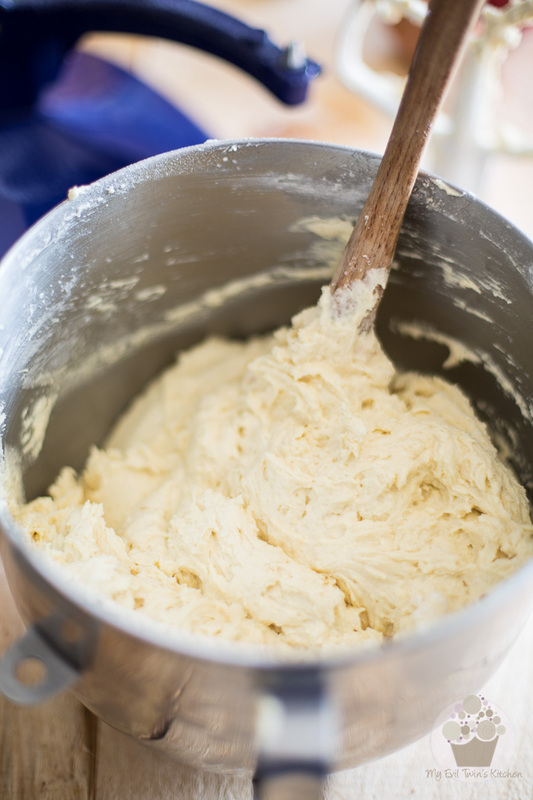 Transfer one third of the cake batter into one of the prepared pans and spread it evenly all the way to the sides. Reserve. 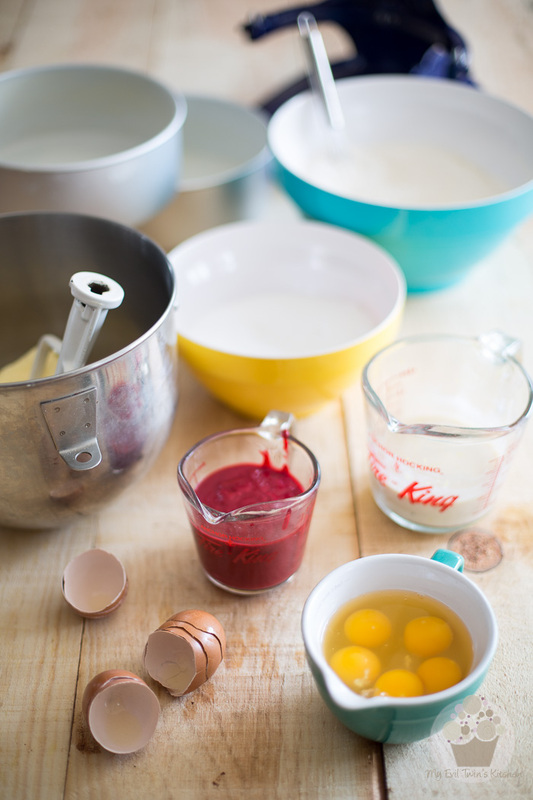 Add 1/2 cup of the raspberry puree* to the remaining batter and mix on medium speed until well incorporated. Pour half of this cake batter into one of the remaining prepared pans and spread evenly. Place the pans in the oven and bake for 30 minutes, or until a toothpick or cake tester inserted in the center comes out clean. Remove and allow to cool slightly in cake pans for about 5 minutes, then turn onto a wire rack and let cool completely, preferably in the refrigerator. *You can make your own raspberry puree by processing approximately 1½ cups of frozen raspberries. Just make sure that you force your puree through a fine mesh sieve to remove the seeds. Make the Swiss Meringue Buttercream - Follow the instructions in the post, but make one and a half recipe (so use 900g butter, 12 egg whites and 750g sugar). 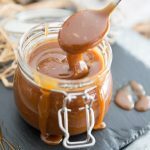 At the time of adding the vanilla extract, also add 3 teaspoons of pure lemon extract and several drops of ivory gel coloring. 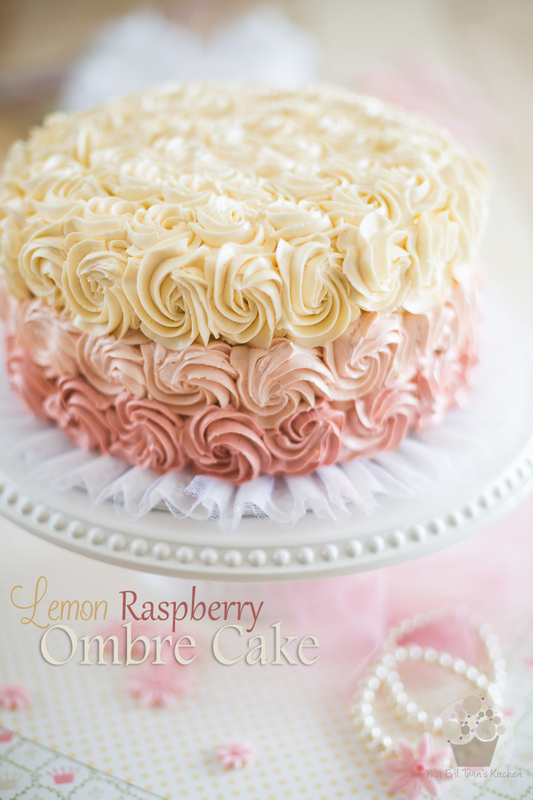 Place the darkest raspberry cake on a cake bord and cover its top with a good layer of ivory buttecream. Top with the lighter raspberry cake and spread some of that icing all over that cake, too. 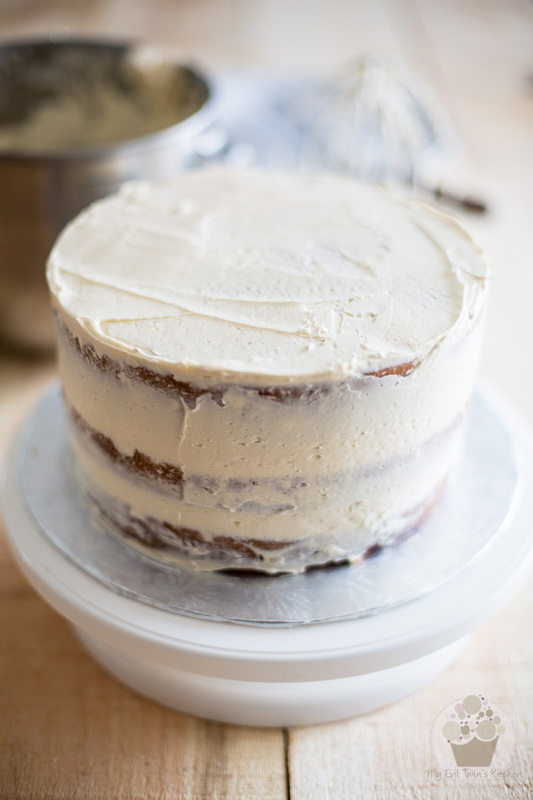 Next, place the light yellow lemon cake over these two layers and crumb coat the entire cake with the ivory buttercream. 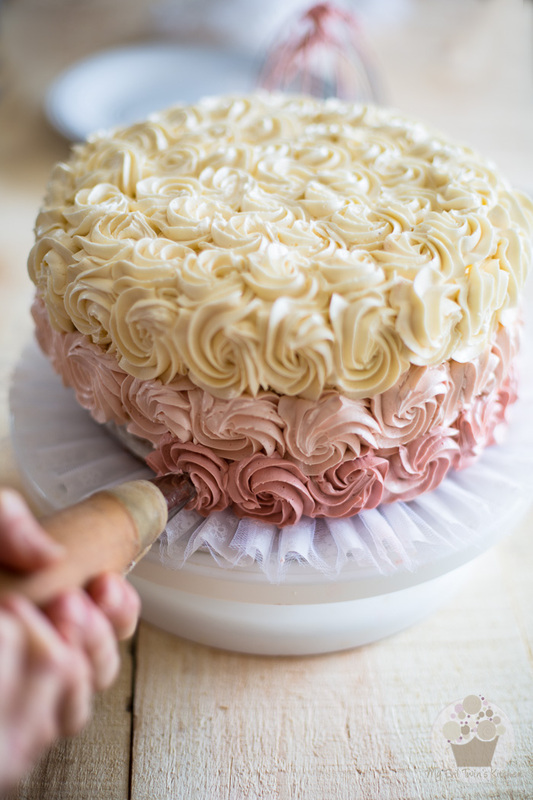 Empty your piping bag in the bowl containing the rest of the buttercream and add dust rose gel coloring to the whole batch until a light, dusty pink color is achieved. Refill the piping bag and pipe swirls around the side of the middle cake. 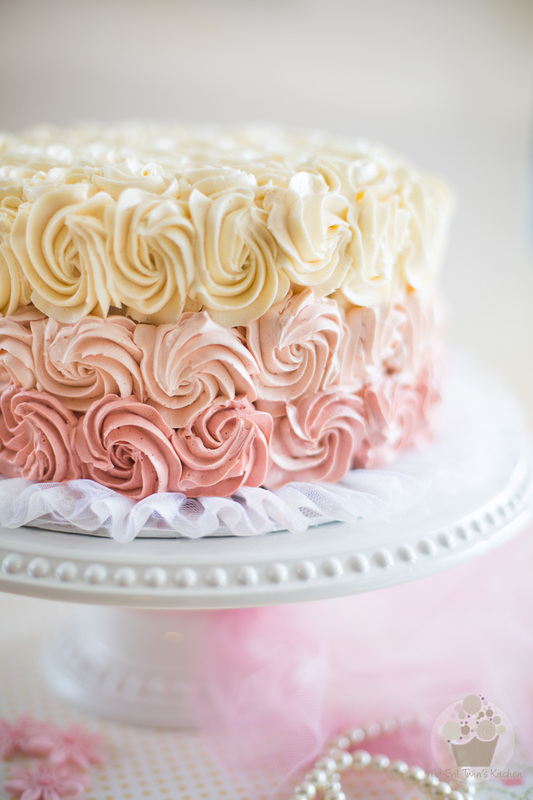 Return the leftover buttercream to the pot and add yet more coloring gel until a darker shade of dusty pink is achieved. 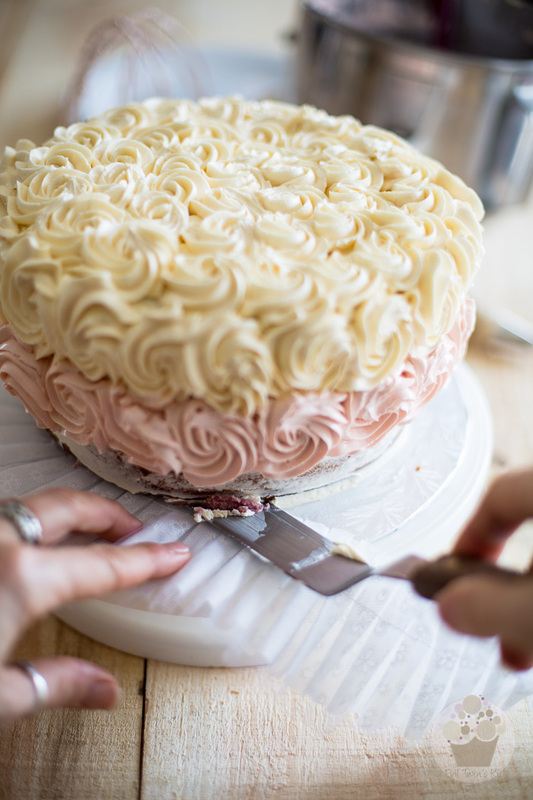 Position the ruffle boarder if using, and then pipe the final layer of darker swirls around the bottom cake. Isn’t she adorable?! And the cake matches her outfit perfectly. What a beautiful and tasty looking masterpiece! Awwww, thank you Sarah! You just left the first ever comment on my brand new blog. This means so much to me. And for that comment to be about my precious little baby grand-daughter? Priceless! 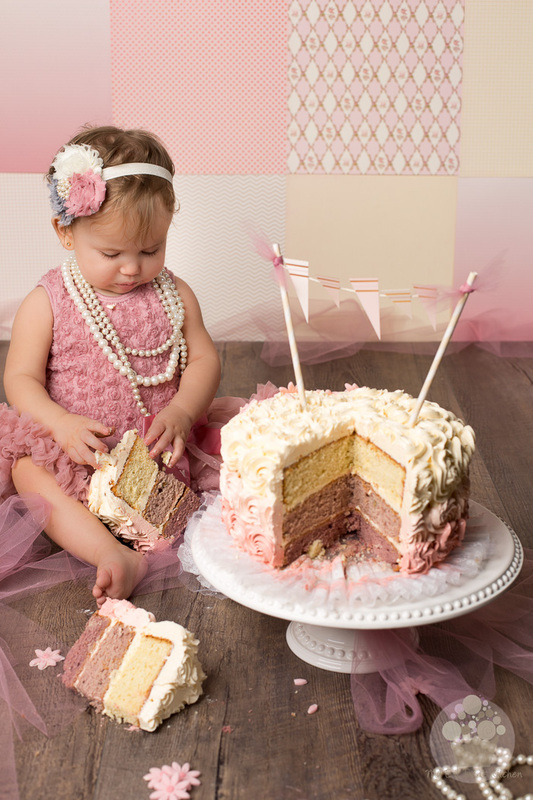 I thought this cake was the most beautiful thing on your blog…then I saw Matilde! What a precious little pumpkin she is! She should have her own blog! Love her name and everything about her. Lucky you, grandmere! Haha! Now there’s an idea! I’ll be sure to mention it to mommy, I bet she’ll be tempted. Likewise, I’ll be sure to convey your kind words to her. She will undoubtedly be super flattered (although I like to think that I passed on some of my genes, you know, so therefore I am greatly responsible for that kid’s adorable looks 😉 ) Thanks again for your thoughtful comment, Dana, I am sincerely touched. The cake is so pretty and the colors are great. But.. forget the cake the guest of honor is what stole the show. She is a doll. Love the color she has on. This pic is priceless. Such a cutie pie!